I can’t go out to the island without a beach bag, right? For those of you who don’t already know, Morgan and I are getting married on an small island in Southwest Florida. We head out there on Tuesday, and I plan on lovely days of relaxing on the beach. I hadn’t thought to bring a beach bag, so I decided to make one out of the cute Orla Kiely dishtowels I bought the other day. They come in packs of two – one printed and one solid. 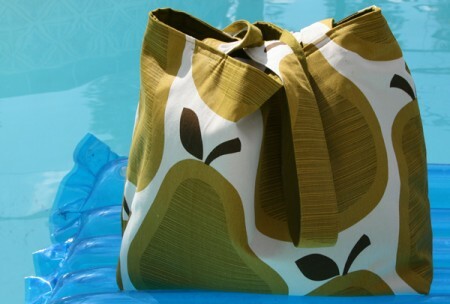 I opted for these cute pears for the outside, with the corresponding olive green fabric for the lining. I made it as large as I could, based on the size of the towels, and it ended up a generous 20″ across by about 14″ tall. It has a large 6″ rectangular bottom, a large divided interior pocket and a little twill tie at the top. Anyway, it turned out just as I had hoped… And I love it! 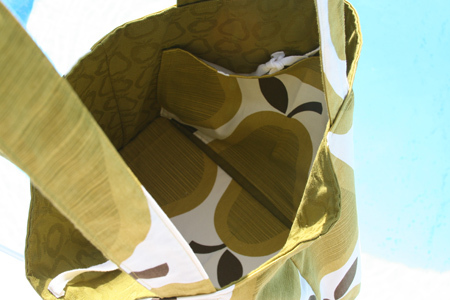 This entry was posted in Household Goods and tagged bag, beach bag, dishtowels, handmade, Orla Kiely, Target, tote. Bookmark the permalink. This is awesome! Great job, and happy wedding! And you’re wearing the skirt! I wasn’t sure I liked it when you showed it the other day, but now I see it ‘on’ it is gorgeous! Happy Wedding – I’m sure it will be a wonderful day, and enjoy your beach relaxing too. Goodness gracious, that’s gorgeous, even more so considering you did it on vacation. I wish I had the perserverance you do in whipping stuff up on the fly. Great job. It looks great. So does the skirt in action, btw. It looks wonderful! And goes great with the skirt. super cute bag, and i love the skirt too!! Ah! The “MUST have new bag before VACATION” sickness – I know it well! Why do we have this need? Anyway, yours is lovely! this is fab! have a great time next week! That is a wonderful bag! Wow, I almost did the same thing with paperchase dishtowels!! Fabulous! 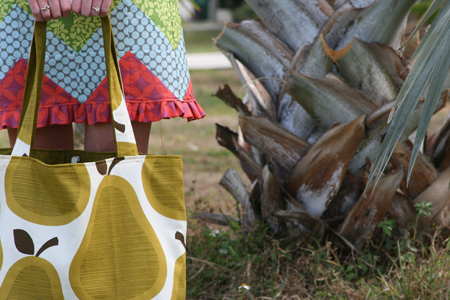 Plus I love the peak at your cute zig-zag skirt in these photos! Amazingly cute!! 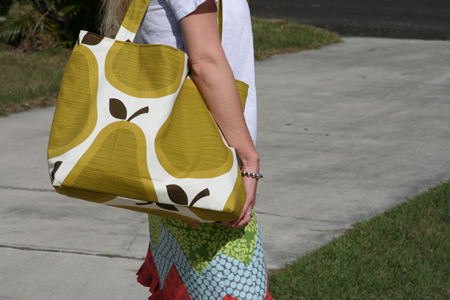 It looks like the fabric was made for the bag – not being dishtowels! Adorable! Second only to that SKIRT! I also have a thing for Orla, but only have a wallet. I may need to swing by a Target. Sorry, accidentally commented twice, so I now I will comment thrice. It turned out really cute and I see your wearing your skirt which I have to say I just love on you. I wasn’t sure on the hanger but it looks really great on. Congrats on the going Wedding. what a great idea! 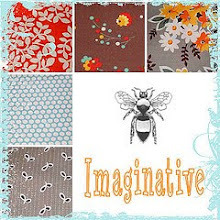 it combines two things that i always lust after (dishtowels and totebags) and never need more of…. and yet can always find a use for just one more. 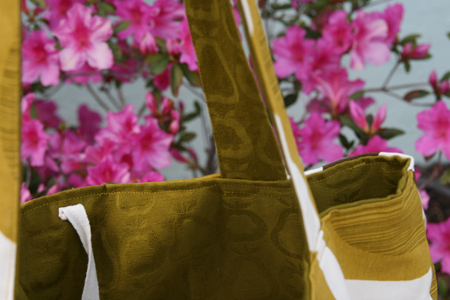 Fabulous bag, wonderful pictures — and most of all CONGRATULATIONS!!! How can you find the time and sanity to blog? Best wishes! This is inspiring. I actually picked up a pack of Orla kitchen towels with the exact same purpose in mind! DARLING!!! I was just at Target last night and was looking at all of the linens and dishes in that line….decided not to buy anything because I don’t NEED anything, but I need a set of those towels now, too stinkin cute!!! It looks so cute with your new skirt! Good job! genius! i love it, i may steal the idea. hope you have a wonderful trip and wedding! PS I’m married to a Morgan too! Who whips up a bag on a whim and has it look that great? You’re out of this world, Ashley! Hope everything goes great for the wedding! Congrats! 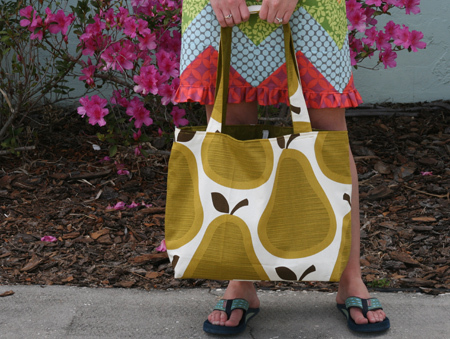 I am loving your skirt and the bag, I just may have to make both but first a trip to target to get fabulous towels. Congrats on the wedding and the bag. 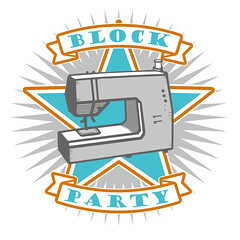 I hope you’ll share pictures of those cute napkins you sewed in use at the reception. I’m thinking of doing something similar for my wedding in October. One of the reasons I love knitting and crochet is how portable it is. I love sewing, but when I’ve been away for more than a few days knitting has been a godsend. Of course I wish I could take a sewing machine with me! Happy Wedding guys, love the bag!!!!! I Recently found your blog. Love everything you’ve made so far, can’t believe you’ve only been quilting a year. 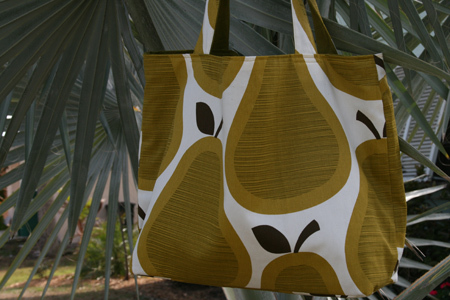 I couldn’t wait to make one of the Orla Kiely Pear Bags – headed out today to get the dishtowels. Only thing of hers left was a few kitchen mats and a tablecloth. On to the next Target – same thing, the shelves were cleaned out, I wanted to cry. Is there a tutorial for this that I have missed?